Ernestomeda, the market leader in designer kitchens of high-end class, introduced a new model Soul and a new layout model of Icon at the kitchen exhibition Eurocucina 2014, held in the framework of the Milan furniture exhibition I Saloni. The designs of the both kitchens were created by a talented designer Giuseppe Bavuso. Soul concept is a mixture of modern design trends with vintage elements. The new fitted kitchen has a modern character, but the style and materials are borrowed from the past. One example of such a combination is a close coupled sink, which can be made of steel materials ICONcrete and Corian ®, and may also have a new finish of Piasentina Stone, Brown Chocolate Stone and Santafiora Stone, reminiscent of the trays for drainage, once found in gardens of suburban villas. When developing a new model, the Ernestomeda collaborated with Molteni Vernici in order to create a new finishing technology NANOCERAMIC NTE ™, which involves the use of nanotechnology. This innovative method allows you to protect the surface from moisture, salt corrosion, thermal shock, chemicals, hot and cold foods and liquids, household cleaning products, artificial lighting and aging. The new versions of the Icon structure have the following key features of the program: from the AIR door to the EVOLUTION island, from the wall block FLEX to the INDOOR cupboards, which are offered with new internal accessories. But the main novelty lies in the innovative finishing, which is very stable in operation: in addition to nonoceramic treatment they use Piasentina Stone for front panel AIR doors and tabletops SET LIVING AREA PROGRAMME. For information: The first version of the ICON kitchen by Ernestomeda won Red Dot Award 2013 and a prestigious award from the Design Museum in Essen (Germany). 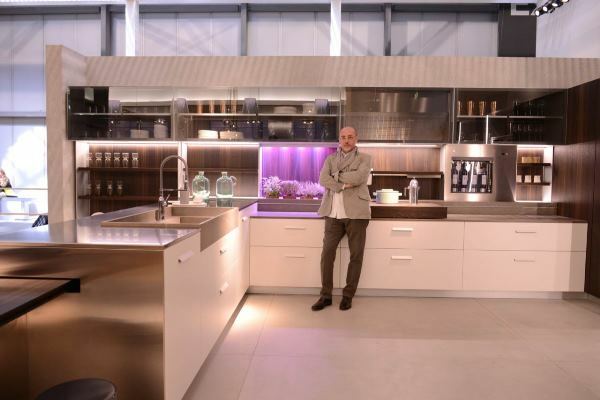 The Icon kitchen was designed by Giuseppe Bavuso and presented during the exhibition Eurocucina 2012. Jury, which consisted of 37 experts, selected the project of Ernestomeda from more than 4,600 applications from 54 countries. Icon was awarded in the category “Product design with high quality materials, which creates an atmosphere of warmth and comfort”.